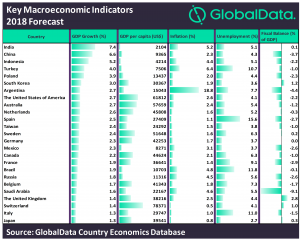 All of the top 25 global economies are set for growth in 2018, achieving an average growth rate of 2.8%, according to recent forecasts by GlobalData, a leading data and analytics company. The top 3 fastest growing economies will be India, China and Indonesia, respectively. India’s GDP growth rate of 7.4% is being driven by the present Governments macroeconomic reforms which includes the unified Goods and Services Tax (GST) and demonetization among other policy measures. Indonesia’s strong GDP growth rate of 5.2% reflects booming inward investment in the country together with the Government’s public sector budget increases. With the exception of Argentina, where inflation is likely to peak at 18.8% in 2018, inflationary pressures are projected to remain largely unchanged across the top 25 global economies in 2018 at an average rate of 3.2%. Unemployment is set to remain high in major economies like Belgium, France, Italy, Spain, Argentina, Brazil and Turkey throughout 2018. Spain is followed by Brazil and Italy where unemployment forecasts are set to stay at 11.8% and 11%, respectively. Overall, most major economies are expected to see a decline in unemployment rates in 2018 compared to last year. Downward pressure on commodity prices is expected to continue to reduce the revenues of major commodity goods exporters like Brazil and Saudi Arabia causing major fiscal imbalances in these countries. As a result, Saudi Arabia’s government is planning to push back the target date of removing its budget deficit from 2020 to 2023.